When you're young, it's hard to think of retirement planning as a priority. You have barely entered the workforce; now you have to think about what to do when you've stopped working? But if you are of the millennial generation, the road to a comfortable retirement should begin now. And with the right moves, you may even be able to retire early. Consider these financial moves to supercharge your retirement plan. One of the keys to saving for a comfortable retirement is to focus on accumulating things that grow in value while reducing your liabilities. This means earning and saving as much money as possible while eliminating debt. It means investing and watching your money grow, through things like stocks and real estate. It means avoiding spending money on things that will lose financial value or have no value to begin with. If you have any earned income at all, you can open an individual retirement account (IRA), which allows you to invest in almost anything and enjoy tax savings along the way. With a traditional IRA, any money you invest is deducted from your taxable income. With a Roth IRA, contributions are taxed upfront, but any investment gains can be withdrawn tax-free when you retire. You will pay a penalty and taxes if you withdraw money before you turn 59½. If you are employed by a company, there's a good chance that you have access to a 401(k) or similar plan. Don't ignore your human resources representative when they hand you a stack of plan documents urging you to sign up. There's no rule that says all your investments need to be in retirement accounts. Regular taxable brokerage accounts don't have the same tax advantages as IRAs or 401(k) plans, but they do offer other perks, chiefly the flexibility to withdraw money whenever you want it. This is especially key for someone looking to retire before age 59. To accumulate enough money for an early retirement, you'll need a healthy and steady income. If your day job doesn't quite pay enough, look for other ways to generate cash. This may mean freelance writing or playing guitar at local coffee shops. Maybe it's tutoring math, working as a DJ, or doing ASMR videos on YouTube. It's simple: The only way to invest money is to save it, and the only way to save it is to spend less than you earn. This may be easier said than done, especially if you aren't making a lot of money early in your career. But it needs to happen. You may have student loans. As a result, you may also have credit card debt. If this is weighing you down, it's time to do something about it or an early retirement will be impossible. 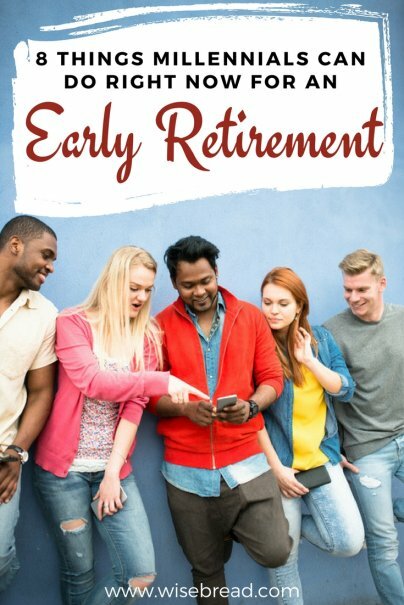 The ability to retire early is as much a product of avoiding disaster as accumulating wealth. It's hard to save and invest aggressively if you find yourself saddled with tens of thousands of dollars in medical bills, or expenses to replace items lost when your apartment flooded.